Regin next tells the tale of his own lost wealth, a story that is connected to the purely mythological world. Odin, Hœnir, and Loki are out for a walk one day and spy an otter half-dozing on a rock after catching a salmon. On impulse, Loki throws a rock and kills the otter, thinking himself clever for having snared both otter and salmon at one throw. In the evening, they arrive at the home of a man named Hreidmar and show him their catch. 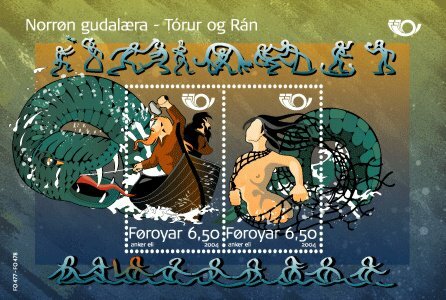 The man is furious, because the otter was actually his son Ótr, who was such an ardent fisherman that he sometimes turned into his namesake animal to catch his prey. He demands wergild for the killing – enough gold to fill his son’s pelt and completely cover it. Loki is, as per usual, sent off to make up for his troublesome behavior. The gods stuff the otter’s skin and cover it with gold, but Hreidmar sees that one whisker sticks out of the pile and demands that it be covered. Odin places the ring on the whisker, and Loki passes on the curse to Hreidmar and his sons. Fafnir, son of Hreidmar and brother to Ótr and Regin, kills his father and takes the gold out into the wilds. He is so foul-tempered and greedy that he turns into “the most evil serpent and lies now upon this hoard.” Regin leaves home to become the smith of King Hjalprek. 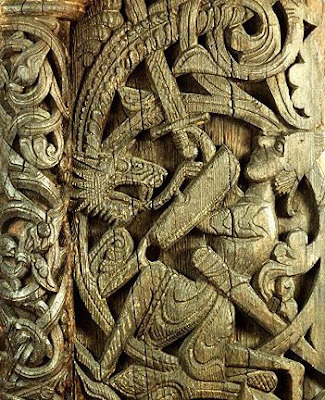 The dwarf encourages Sigurd to slay the dragon and claim the treasure for himself, and the young man insists he must be forged a sword equal to the task. 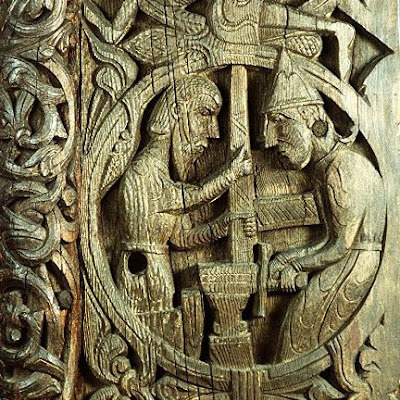 The first two swords shatter when the powerful youth strikes them against the anvil, so Sigurd asks his mother for the two pieces of Sigmund’s mystic sword Gram (“wrath” – a fitting name for a sword gifted by Odin / Wotan). At this point, the meaning of his mother’s name becomes clear; Hjördís means “sword goddess,” and she is revealed as another valkyrie who has married a man of the Volsung line. Regin refashions the weapon, which seems “as if flames were leaping from its edges.” The sword is powerful enough to hew the anvil to its base, and sharp enough to cut a piece of wool in two when Sigurd lets it gently run against the blade in the river’s current. 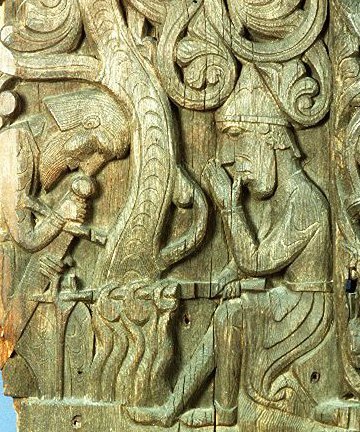 Regin now demands that Sigurd face the dragon Fafnir, but the youth insists he must first avenge his father. He is given a force by Hjalprek and Alf, and sets off in ships to face the sons of Hunding. When they pass a rockyheadland, Odin appears and asks to be taken aboard. The powerful storm that had troubled them immediately subsides and they sail peacefully until they reach the land of their enemies, at which point Odin disappears. Sigmund and his forces attack the sons of Hunding, including Lyngvi, the one who led the attack on Sigmund. Sigurd personally kills every remaining son of Hunding and heads back to Regin, saying he is now ready to face the dragon. Sigurd and Regin ride to the dragon’s heath and onto the path that Fafnir takes when he goes to drink water. The dwarf advises the young hero to dig a ditch, lay in it, and stab up into the dragon’s heart when he passes over. Regin then runs off in cowardly terror, and Odin appears while Sigurd is digging the ditch. The god advises that he dig secondary ditches for the blood to run into, so that he doesn’t drown in the flood that will pour out of the dying serpent. The plan works, and the mortally-wounded dragon tells Sigurd that the treasure will be the cause of his own death, but also reveals that the hoard contains an Ægishjálmr (“helm of terror”), a magical helmet that gives him dominion over others. Regin reappears after the battle, drinks his dragon brother’s blood, and asks Sigurd to roast the monster’s heart so he can eat it. While roasting the heart, Sigurd pokes it and licks his finger to see if it’s ready to eat. He immediately understands the speech of the birds perched in the tree above him. They tell him that he can gain wisdom by eating the heart himself and warn him that Regin is going to betray him. They advise him to kill his foster father, take the treasure, and ride to Hindarfell (“hind mountain”) to seek the wisdom of the sleeping Brynhild. Sigurd follows all of their advice. 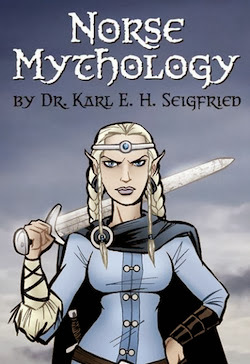 Dr. Karl E. H. Seigfried writes The Norse Mythology Blog. A Norse mythologist and musician in Chicago, he is Theology and Religious History Faculty at Cherry Hill Seminary and Adjunct Professor, Pagan Chaplain, and Pagan Forum Faculty Advisor at Illinois Institute of Technology. He is also a featured columnist for The Wild Hunt and serves as goði (priest) of Thor's Oak Kindred, an inclusive organization dedicated to the practice of the Ásatrú religion in Chicago. Click here for more about Karl. 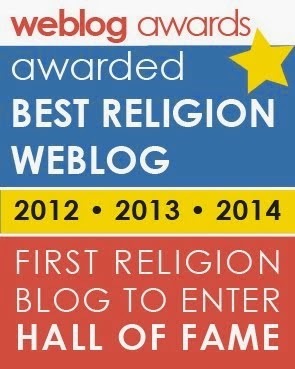 Want to learn about the Ásatrú religion? Click image to read about modern Heathenry. The Norse Mythology Blog supports the American Indian College Fund. Won't you? Join norsemyth.org in supporting the positive work of First Nations Development Institute. norsemyth.org supports the Green Party. Please join us & work for a better world! © 2010-2019 by Karl E. H. Seigfried. Logo by Erik Evensen. Banner art by Johan Christian Dahl.